“You can eat as much as you want, because it’s already half digested,” said the man sitting to my right, smiling through his thick brown mustache and watching expectantly as I took another swig of Viking beer. I forced myself to smile back at him as I speared a gelatinous piece of yellowish whale fat with my fork. It quivered as I lifted it into the air. Before I could take a bite, our hostess, Sigurveig, appeared, brandishing a large green bottle. “More schnapps?” I nodded in agreement, happy for the distraction. Setting the flesh back on my plate, I tore off a piece of flatbread and placed it in my mouth. It was chewy — not unlike pita, but somewhat denser. And it tasted like charcoal. Well, this is what you signed up for, I told myself, washing the flatbread down with another drag of lager. Sipping my morning cup of coffee six hours earlier, I had watched the sky fade from an inky midnight blue to chilly cyan. It was February in Reykjavik, Iceland, the northernmost capital in the world. I had traveled 2,600 miles to a frozen slab of volcanic rock in the middle of winter to experience Thorrablót, a celebration of rotten-tasting food. And I’d come at the right time. 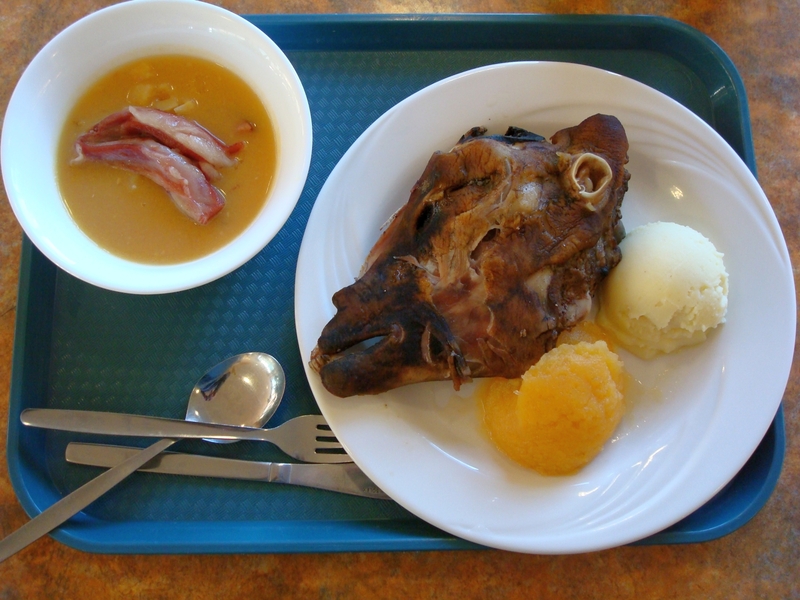 It was Thorri, the fourth winter month of the Old Icelandic calendar, when offerings like sheep-head jam and fermented shark appear alongside typical Scandinavian fare such as dried cod and marinated herring. As a gastronome with an urge to journey back in dietary time, I hoped that an iron stomach and a little luck would teach me something about Iceland’s culture. My introduction to traditional Icelandic cuisine was through Bjarni Alfredsson, a gregarious 59-year-old who offered to buy me lunch at Fljótt og Gott, a cafeteria-style restaurant he owns in Reykjavik’s main bus station. 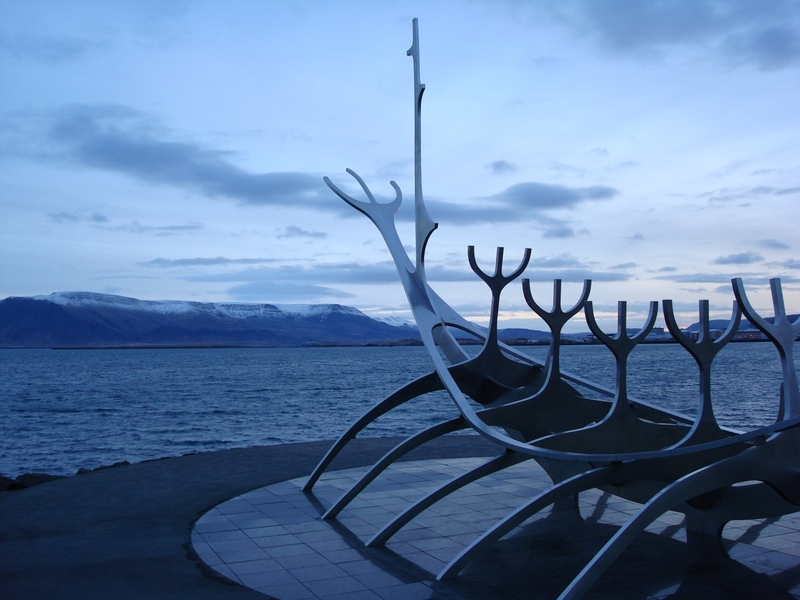 Eagerly accepting his invitation, I hurried to Vatnsmyrarvegur — an almost unpronounceable address — where he met me with a firm handshake and a stained white chef’s coat. Shortly after showing me to a table, Alfredsson returned with a plastic tray laden with meat and starch. On the left, two bright pink pieces of fatty lamb floated in a large bowl of thick, mustard-colored soup. 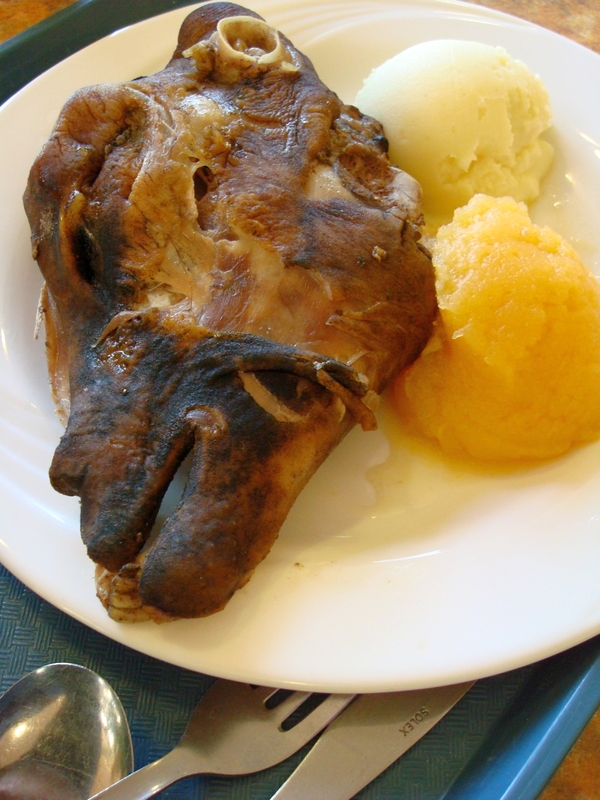 To the right, a scoop each of pureed turnips and mashed potatoes flanked a boiled ovine head (svid), its desiccated lips parted to reveal several narrow, rectangular incisors. Fumbling for the silverware, I glanced at the meal in front of me, and then back up at Alfredsson’s round, unshaven face. “Very tasty. Sheep’s head,” he explained, reassuringly. Using the dull knife provided, I sawed into the sheep’s face to cut off a tough and somewhat rubbery piece of gray meat. The scoop of unseasoned vegetables did little to enhance the flavor. I sliced another chunk from the neck and slowly chewed, wondering how often Icelanders actually order this stuff. “Have some tongue,” Alfredsson suggested. I mumbled something about getting full. Alfredsson was referring to his country’s relatively unfortunate culinary history: several centuries characterized by poverty, famine and limited resources. To survive harsh winters on isolated homesteads, Icelanders had to rely on food stores that were anything but rich in variety. Towns didn’t exist until the 19th century, and even then, merchant ships from Denmark or elsewhere in Europe only brought commercial goods during the summer months. Cereal grains, which were less profitable than other commodities, didn’t often find their way to Iceland’s remote fjords, and without access to much salt or naturally occurring spices, Viking settlers preserved what little they had by smoking it (often with sheep dung, as wood was scarce, too) or keeping it in sour whey. The dishes served at Thorrablót hearken back to those austere years. For modern inhabitants of this island nation, consuming smoked and fermented foods is a form of cultural nostalgia, a celebration of the way things were. Today, Iceland ranks high on the Human Development Index, and its citizens enjoy a comfortable standard of living. 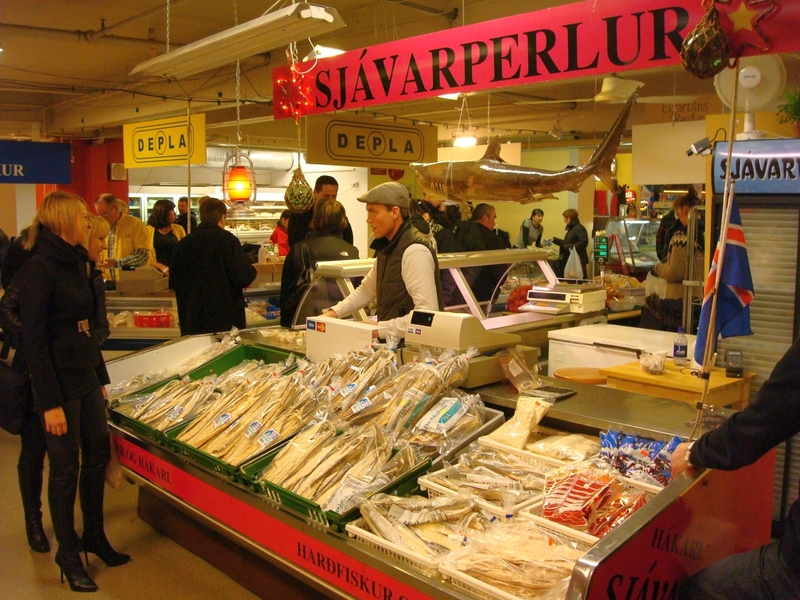 Few, if any, Icelanders eat traditional dishes like rams’ testicles (hrútspungar) out of necessity anymore, opting instead for popular ocean-fare delicacies such as creamy lobster soup and seared sea scallops. Processed fish, particularly cod, haddock, saithe and herring, represents roughly 40 percent of Iceland’s export economy. And though the success of this economy largely depends on the quality and palatability of this seafood, neither of the aforementioned nouns can be used to describe what passes for fish dishes during Thorrablót, which I discovered for myself while at a Thorri feast with Árni Björnsson, the former curator for ethnology at the National Museum of Iceland. Under the eager gaze of my hosts, I speared a chunk of kaestur hákarl with a toothpick and popped it into my mouth. My first reaction was to gag at the burning sensation that prickled my tongue and climbed up my nostrils. My second was to slug a small glass of Brennivín, the schnapps that continued to be liberally portioned out to everyone around the table. I’ve never tried boot polish, but I’m willing to guess that the taste of putrefied shark hasn’t improved since Auden’s trip nearly 75 years ago. And why would it? The preparation method has remained the same for generations: Skin, gut and butcher the animal into long strips. Bury these pieces in a shallow hole by the sea and wait three to four months for the meat to ferment. 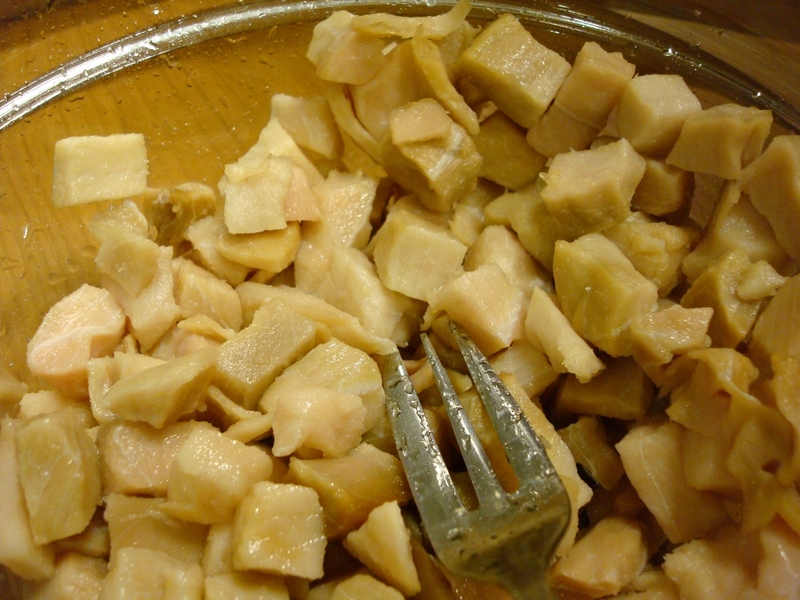 Hang them in a shed to dry for another few months, cut the flesh into small pieces and serve it to a devoted Icelandic customer base that considers kaestur hákarl a delicious appetizer. That night, watching my dinner companions toss back shots of caraway-flavored Brennivín while joyfully shouting along to a heavily accented version of Billy Joel’s “Piano Man,” I found myself overcome by a feeling of warmth and satisfaction. Sure, the pungency of the shark made my eyes water, and the slimy blob of súr hvalur, or sour whale, required multiple shots of schnapps to keep the nausea at bay, but the haggis-like blood sausage (slátur) didn’t taste half bad, and the smoked lamb was actually quite good. What the Thorri feast lacked in culinary masterpieces was made up for in congeniality among the attendees. The celebration seeming to be as much about beating the 18 hours of darkness as the food. By 9 p.m. we were out of beer and running dangerously low on Brennivín. But the mood remained cheerful, a happiness that can only be experienced on a full stomach. Outside of the modern harbor-side building we occupied, the dark North Atlantic stretched to the horizon. The streets were silent except for the frigid February winds buffeting the windows. At that moment, the temperature didn’t matter. Our hunger was satiated, our thirst was slaked, and we had music to help us pass the long winter night ahead. Ben Keene is a beer journalist, travel writer, and the author of The Great Northeast Brewery Tour. An intrepid eater who never goes anywhere without a pair of hiking boots, he also blogs at Where and Back, you can follow him on Twitter here: @whereandback.